According to the Food Allergy Research and Education (FARE), it is estimated that almost 15 million Americans, young and old, currently suffer from a food allergy, intolerance or sensitivity of some sort. Although much more light is being shed on this major healthcare concern these days, this number seems to be growing with each year. So why is it that we are becoming less and less tolerant of our food choices (even healthy ones), and what is causing this epidemic? 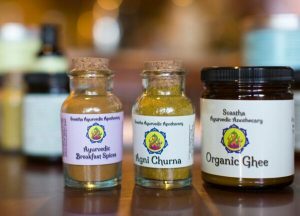 In the eyes of Ayurveda, it comes down to one final word: Digestion! Although there are some major differences between the three main types of negative food responses (spec. allergy, sensitivity and intolerance), Ayurveda terms them all the same. They are all listed under Asatmaya (translated as intolerance) and although different effects technically occur for each type, the end result is the same: inflammation, reduced digestion, toxic accumulation and eventually (with longterm exposure) disorder and disease. Although they are all considered to be ultimately intolerable (asatmaya) by the system, here is a more scientific look at the specific differences for each intolerance type. The commonly known food allergy is called so because it creates an immune response, producing an increase of Immunoglobulin E (IgE) antibody and mast cell activation. 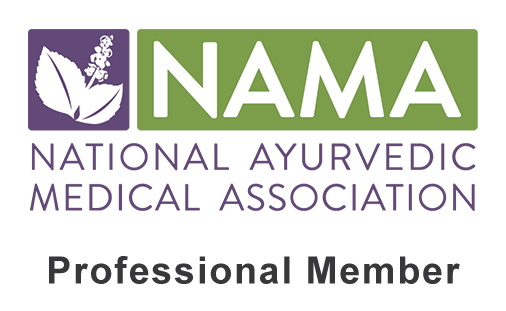 These mast cells release histamine (which is considered ama or a toxin in Ayurveda) and produces an inflammatory reaction. This in turn causes a fairly instant and obvious reaction such as rash, hives, diarrhea, vomiting, abdominal pain, headache and/or increased heart rate. In severe instances the allergic reaction will cause the life-threatening anaphylactic shock. With these more abrupt and noticeable effects, an allergy tends to be well known to the recipient and therefore more likely to be avoided. Food sensitivities also create a negative immune response, but this time they increase the production of Immunoglobulin A (IgA) and Immunoglobulin G (IgG) antibodies. These particular antibodies, although still equally as harmful to the system when overproduced, often manifest milder and less obvious symptoms than its allergy counterpart. In fact, the symptoms are so obscure they can even occur days after the consumption of that particular food. The specific symptoms will vary with each individual; however, they are often seen as vague issues such as sluggishness, fatigue, mental fog, abdominal pain and cramping, inflammation in the gut, heartburn, GERD, loose stools, constipation, skin disorders, respiratory issues, sinus issues, etc. Since these symptoms are not as instant, they can seem to be unrelated and go overlooked or can even come to be considered normal. With the illusive nature of these symptoms, this type of intolerance can get misdiagnosed or undiagnosed altogether. Food intolerance is the only one of the three that does not spark an immune response. Instead it is caused by the lack of a particular enzyme that is needed to break down a particular protein. This causes an inability to process that food, making that food indigestible and toxic to the system. The symptoms of intolerance may be more instant and obvious such as severe diarrhea shortly after consumption, or it can be milder and more obscure such as inflammation in the GI tract. The latter can often be more dangerous, as the consumption of an unknowingly intolerable food can lead to severe issues (i.e. leaky gut, diverticulitis, IBS, etc) when consumed regularly longterm. A few common forms of food intolerance include milk, dairy, gluten and sugar. No matter which of these three types of intolerances you may suffer from, the number one root cause is from a weak Agni or digestive fire (although other factors will play a role), and therefore the digestion must be treated. But before we go into treatment, let’s discuss the top major allergenic/intolerable foods, common signs and symptoms of food intolerance and common causes. Although these are the most common food allergens on a general scale, each dosha type is more susceptible to particular food intolerances of a wider variety. Each food intolerance is caused by a digestive disorder stemming from that particular dosha. For example, Vata digestion (called Vishama Agni) will cause a negative reaction after eating heavy meats such as gas, bloating and constipation. If the dosha and digestion are in balance, then that particular food can be consumed without any negative effect. Vata food intolerances typically cause Vata symptoms such as gas, bloating, cramping, constipation, dry skin, malabsorption, joint pain or arthritis, anxiety, restless mind, hyperactivity and insomnia. Pitta food intolerances typically cause Pitta symptoms such as hyperacidity, inflammation (in the gut and/or other areas), diarrhea, loose stools, heartburn, hives rash, eczema, psoriasis, headache, redness, mouth sores, anger, frustration, impatience or (in severe cases) anaphylactic shock. Kapha food intolerances typically cause Kapha symptoms such as heaviness, lethargy, sleepiness, mucus, congestion, cough, colds, sinus issues, asthma, edema, sneezing, runny nose, wheezing, mental fog, low motivation and depression. The long list of effects from a food allergen can vary quite a bit. They can also be instant and obvious reactions, or they can be a bit more obscure and spread out. In fact at times they can occurs days after consumption, or only when a food has been avoided for a couple days and then introduced again. They may only show up in times of weakened immunity, high stress or other imbalance, while not be an issue when one is strong, robust and at their best. Whatever the case, here are some of the main effects to look out for when dealing with a potential food intolerance. Although the causes (yes, plural) will vary for each individual, it is fairly safe to say that an imbalance in the digestion is always going to play a role. However, there often are multiple causes at play, all of which should be addressed and eventually removed if possible. Here are some of the most common causes to look out for. Phew! With the long, varied list of causes and effects of food intolerance, it is no surprise that they can be hard to detect and distinguish. Confusion around what foods are tolerable (satmaya) and which are intolerable (asatmaya) can often lead to frustration and hopelessness. Therefore it may be useful to perform a muscle, skin or blood test with a doctor or holistic practitioner. However, these tests are not always accurate in detecting food intolerances (or sensitivities, etc) and therefore it may be necessary to perform an elimination diet (see below for details) and listen to your own body. 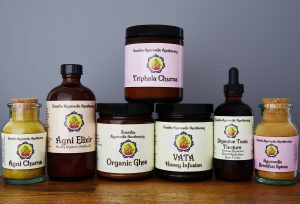 In the eyes of Ayurveda, no matter what the scientific title may be the general treatment protocol will remain the same, as they can all be classified as asatmaya (intolerance). Therefore they will all involve removing the cause(s), increasing Agni (digestion), palliating the specific symptoms, reducing inflammation, detoxifying the system and increasing Ojas (immunity, vitality, strength). 1. Remove the main cause (meaning allergenic/intolerable foods) using the elimination diet. The first line of action in any treatment protocol must be to remove the cause. Otherwise we are simply palliating the symptoms without any real change. Since many food allergies are hard to decipher, one should perform a strict elimination diet for three months before trying to rotate the potential allergenic foods back into the diet. Here is a general breakdown on how this should look. Give up all of the most likely allergenic foods (as listed above) along with any other suspects that may not be on our lists. Remove each of them 100% from the diet for three months minimum. After this timeframe, rotate the previously eliminated foods into the diet one at a time each week (i.e. first week add in dairy, next week eggs, next week grains, etc). After giving up a food type for three months (with absolutely no cheating! ), the body should become much more sensitive and show a negative reaction more quickly and powerfully, making it fairly obvious if your body can tolerate it or not. Any foods that spark a negative reaction (i.e. rash, inflammation, gas and bloating, heartburn, fatigue, sleepiness, congestion, etc, etc), should be given up indefinitely. Many food intolerances can be cured after a 12 month avoidance period (shorter for children), when one has strengthened their digestion and flushed out the built up toxins in their system. 2. Increase Agni (digestive fire). While performing the elimination diet, it is important to simultaneously strengthen the digestive fire. This will allow the body to process food better and reduce the likelihood of the food intolerance. Here are some steps to take during this time. Remember consistency is essential for effective results! 3. Follow a diet according to doshic imbalance and allergenic food type. Once you discover these, you can then identify which dietary recommendations to follow. The lists that are shown above will also help to guide you. For example, if you suffer from chronic mucus, runny nose and congestion and are sensitive to dairy and gluten, you are most likely suffering from Kapha type digestion (aka Manda Agni) and would therefore follow a Kapha-reducing diet. 4. Commit to eating clean! Eliminate all GMOs, processed foods, preservatives, additives and dyes (read labels!). No matter your dosha type or food intolerance, these “foods” will weaken the digestion and contribute to food intolerance and toxic accumulation. Our bodies simply do not recognize these food types and therefore cannot process them properly. This in turn creates toxic waste in the system and leads to intolerance of these foods and potentially sensitivities to other foods. This step is extremely important to be strict with. The best way to follow clean eating is to eat organic, read labels and make your own meals. There are hidden ingredients in so many packaged foods, prepared foods and restaurant meals- even the seemingly healthy ones. Taking the time to prepare your own meals and snacks will be essential. Remember you and your health are worth it! Check out our long list of healthy meal and snack recipes here! 5. Increase the intake of vitamins, minerals and antioxidants in the diet. Since food intolerances often lead to malabsorption of nutrients, it will be beneficial to increase your intake of all of these essentials at this time. Further, this should not be accomplished with supplements, but instead through eating a healthy diet filled with a wide variety of colorful fruits, veggies and other nutrient rich foods. Aim to eat a large serving of vegetables with both the lunch and dinner, and a smaller amount of low sugar fruits between meals or as your breakfast (do not eat fruit with any other foods however). The most important vitamins and minerals to look out for will be vitamin C, vitamin A, vitamin D, vitamin Bs, magnesium, and a wide range of antioxidants. These all will help boost the immunity, reduce inflammation and heal cellular degeneration. Since many individuals with food sensitivities have been ingesting the intolerable foods for a long time, it is likely that toxins have accumulated in the system. This will reduce the digestive fire further and lead to more severe reactions to that food. 7. Promote healthy gut flora. While we work to increase digestion and flush toxins, we must also be promoting healthy bacteria in the GI tract as well. It is possible to take a probiotic supplement, however, I highly recommend getting your probiotics from a healthy whole food source. Stress can cause or provoke just about any disorder imaginable. It weakens our digestion, increases inflammation, reduces immunity and depletes our Ojas. Between these major factors, stress will undoubtably make any food allergy more prominent or even manifest out of nowhere. Therefore stress-reduction is an essential addition to our treatment protocol for any type of food allergy, intolerance or sensitivity. Here are some effective ways to reduce the stress in your daily life! Take deep breaths every hour, avoid shallow chest breathing! When dealing with food allergies longterm, our natural defense is sure to become depleted. This only makes us more susceptible to the sensitivity and the nasty cycle continues. On the contrary, taking measures to strengthen our immunity at this vital time will help expedite the healing process and allow the body to fight against the allergen. Here are some tips for increasing your immune system naturally. Eat three healthy, home-cooked meals each day; do not skip meals! Read our extensive article for 11 ways to increase Ojas here. Try our Ojas-Increasing Oatmeal Recipe. Try our Ojas-Increasing Energy Ball Recipe. Whether you are suffering from a food intolerance, allergy or sensitivity, it is essential for our longterm health to discover the culprits and remove them from our daily diet. Since a weakened digestive fire is said to be at the root cause of all asatmaya (intolerance), then this should be your number one focus when treating the food allergy. Once the digestion is robust, the body is detoxified and balance is restored in the system, the original allergen can often be reintroduced (ideally after a 3-12 month period) without negative reactions. Until then one must be strict with the allergen avoidance, as even small amounts every so often will delay the healing process. Loved this informative and well written article. I’ll refer back to this as a regular reminder. Thank you! Thanks for the kind words Govinda! We can all use reminders sometimes:) I am happy you have found the information helpful. Please let me know if you ever have any questions!